Unfortunately we have many attempts by well-meaning teachers to teach the public on different topics. In our case, we are dealing with a seemingly simple case of Hebrew. The name קֹרַח-Qorach shares a form with the word קֵרֵחַ-Qereach-Bald. 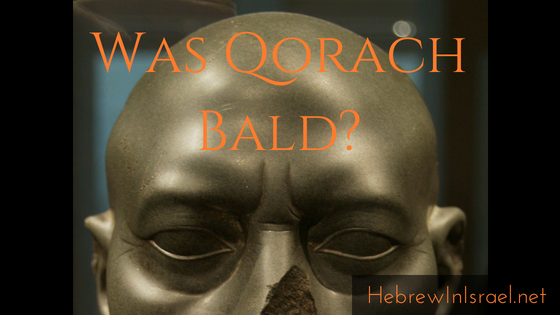 Martin Noth, for example, argued that the name Qorach was derived from the Hebrew word for “bald”, but many others have done the same. Though a very basic understanding of Hebrew might lead one to think that the words are the same, we actually have evidence of them not being the same word. As I have explained in previous posts and videos, Hebrew has a long history of changes in sounds, while the graphic representation of the consonants has not changed. During earlier times, the consonant ח, which is the last consonant in both words, had a double sound of velar and glottal origins. In time, the velar sound passed from ח to the softer sound of כ when it lacks the dagesh lene, creating a double sound of K and KH. This change moved Hebrew speakers from using both sounds, creating in some cases an unclear/incorrect understanding of Hebrew, incorrect root identification and incorrect parsing of words. Hence, knowledge of modern Hebrew, or even medieval Hebrew, cannot help in the process of understanding particular words in Hebrew. To resolve such problems, Bible scholars and Hebraists resort to searching other languages to see if there are parallels to the Hebrew word, or in some cases a transliteration of such words. In our case the Septuagint helps resolve the question. The Greek translation with all its faults does have much value in certain places, including the understanding of names due to the fact that names are not translated, but transliterated. In our case the name Qorach is transliterated to Κορε indicating a glottal sound which is not the same root consonant for the word “bald” which uses a velar sound. This is indicated by the lack of transliteration for the last consonant. When the sound is a velar sound, it is transliterated as “x”. However, because Greek does not have a glottal sound comparable to the Hebrew glottal it only places the vowel point and does not place a consonant for the glottal sound. The vowel point setting is more fitting to a word related to the word “bald”. The transliteration of this name into 6th century Assyrian documents found in Nineveh indicate a transliteration using a velar sound for the ח. Unfortunately research has yet to find an explanation for the name Qorach. As can be seen, the information above demonstrates that the assumption of a link between the name Qorach, and the adjective Qereach is incorrect.